We sell Ready-MIx Tuckpointing Lime Putty! Just open the lid and you can use straight away! Does Ready-Mix Lime Putty contain sand? Yes. our Ready-Mix Lime Putty already contain sand. So you do not have to add any sand for normal tuckpointing. And you do not have to add any additional sand when simply filling in small gaps in mortar. What is the Shelf life of Ready-Mix Lime Putty? 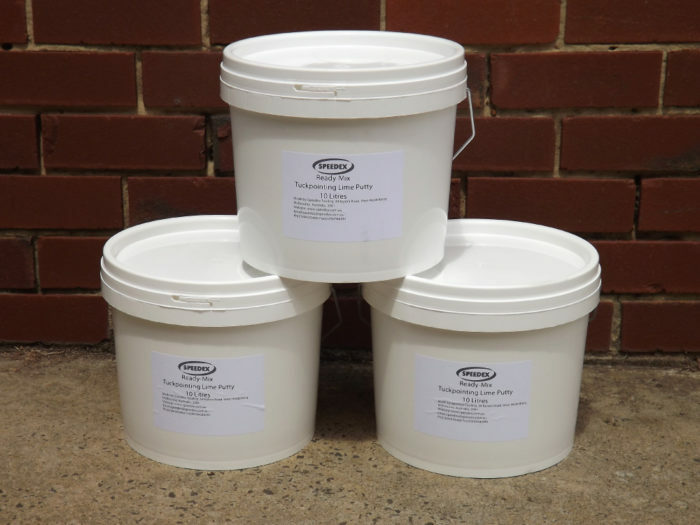 Our Speedex Ready-Mix Lime Putty has a very long shelf life of 10 years plus if bucket sealed and stored in a cool place and not allowed to dry out. Yes, our Ready-Mix Lime Putty can be used for tuckpointing lines, and also to repair holes in brick mortar in existing heritage brickwork. You do not have to add any ingredients apart from say coloured oxide when used as a mortar "filler" between the joints, as the Lime Putty by itself is sufficiently suitable to do this purpose. However you can add a little bit of sand (maybe cement - however as mentioned elsewhere cement being impermiable prevents buildings breathing and may end up in cracks through brick and stone instead of just through the joints as cement is harder or as hard as the material it bonds together) than if you choose when used as mortar if structural integrity is more critical for very worn or very deep joints or cracks below 10mm deep but not usually for surface application as Tuckpointed Joints using Lime Putty are usually less than 10mm deep. If using Ready-Mix Lime Putty as a Mortar you can add additional sand - around 20% more sand. Just filling on holes does not require any more sand. Adding more sand increases structural strength. Should I add cement or plastisizers to Speedex Ready-Mix Lime Putty? NO!! For Heritage Restorations or tuckpointing in general- NO!!. 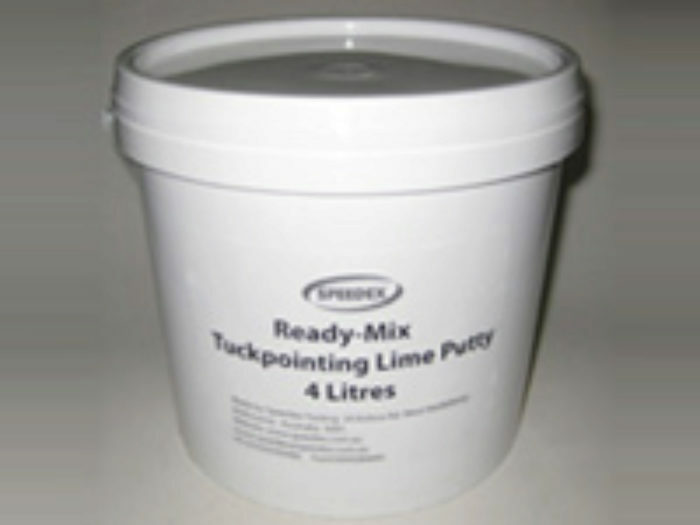 Do not add cement when using our Speedex Ready-Mix Lime Putty for any Tuckpointing work. As cement does not allow the tuckpointed area to breath and the surrounding brick or stone may crack as you want the wall and mortar to "breath"- allowing moisture to naturally ventialet throughout and during any changing season of the course of a year. Plastisizers do not allow the wall to breathe! So Do NOT add plastisizers to our Ready-Mix Lime Putty - your homes walls will be more subjected to cracking as plastic does not allow moisture to move naturally from wall to outside and vice-versa. By adding more fine sand you can increase the Strength to NHL 4 - 5, so if you want to use as a mortar you should add another 20% sand. You can add 1kg of fine sand to each 10L bucket of Ready MIx Lime Putty in order to improve its structural strength to be more suitable for load bearing applications. When tuckpointing you should do around a square metre or so at a time. You fill in and apply the coloured oxide base first over the given area and then you apply the fine line over the top. You should NOT allow the underlying base to dry out prior to applying the tuckpointed (white or coloured) fine line. As if the base mortar is too dry then the difference in drying of the fine line and mortar will cause the line to crack due to differences in expansion or shrinkage rates. So as a general rule the fine line should be tuckpointed within 3 hours of applying the base mortar. Note: by "mortar" I am referring to the Ready-Mix Lime Putty with coloured oxides added. A 4L bucket of Ready-Mix Lime Putty should tuckpoint do a minimum of 20 to 22 square metres of wall in terms of filling the underlying coloured oxide base plus adding the fine line on top. A 10L bucket of Ready-Mix Lime Putty should tuckpoint approximately 50 square metres of wall in terms of filling the underlying coloured oxide base plus the adding fine line on top. This is assuming that you are only filling a fairly shallow gap between the bricks (half a finger nail deep) and depends on how much you watse and other factors such as brick/stone type, size and shape and how deep and the gaps are and how much you have to fill aswell as thickness of the line itself or profile of the line. So use this as a rough guide only. How long does it take for Ready Mix Lime Putty to dry? It should take over night or next day for the tuckpointed area to dry. So the following day the wall can withstand rain or dry to touch etc. How much Coloured Oxide do I add to the Ready Mix Lime Putty? You should be fairly generous when adding coloured oxide to lime putty. You should aim to add 20% by volume approximately of oxide to lime putty as a general rule. When adding coloured oxide you will notice that the lime putty will tend to dry out as the oxide is basically dry powder. So yes you should add a little more water to the lime putty to improve the wetness. When adding adding additional water or oxide please remember to thouroughly mix it through so it is evenly mixed. We send our Ready-Mix Lime Putty Throughout Australia and New Zealand and Worldwide via Australia Post or DHL Express or Hunter Express and other couriers. All of our Speedex Ready-Mix Lime Putty is now sent packaged in heavy cardboard boxes and strapped so they are not prone to damage via transport. Can we send tuckpointing tools with Ready-Mix Lime Putty? Yes we can place additional tools inside or secured to outside the heavy cardboard delivery boxes to keep delivery low as possible. We can also stick on tools to the top lid of the bucket whenever possible to save on postage and if heavy cardboard boxes not required - such as pick up from store. If you order straight edges and lime putty we stick on/attach securely the straight edge cardboard postal tubes to the top of the lime putty boxes so only one parcel is required. If multiple large 10L buckets are ordered then they are sent individually. Our automatic postage calculator does not process orders over 22kg each so if you would like multiple 10L buckets or combined tools that weigh over 22kg then please write to us at speedex@speedex.com.au and we will manually work postage out for you. We can send just our online shopping cart does not split oders at the present time. PLEASE NOTE regarding fastest local Australia wide delivery only: Lime Putty boxes are too large to fit inside a 3kg or 5kg Next Day delivery Australia Post Express Post Satchel so we have to send all Lime Putty Parcels in a heavy cardboard box with strapping so they are handled with care and sent by normal regular Parcel Post (5-6days delivery) or Express Parcel Post (2-3 day delivery within Australia). So the fastest delivery method within Australia is Express Parcel Post which is 2-3 days not next day delivery. Unfortunately our website shopping cart calculator bases shipping method only on weight not size so please do not expect next day delivery for any lime putty as next day delivery is only available for anything that we can fit inside an Express Post Satchel and fits inside the regular Post box slot. So if your shipping says it is next day delivery then please note that it will unfortunately be 2-3 days due to size not weight. IMPORTANT: Please remember to drain off small top layer of sealant water before using or prior to stiring putty, otherwise mix may be a little too wet. If you forget and accidentally mix the sealant water through the mix, dont worry - just give bucket a quick shake, so as to settle the lime putty to bottom of the bucket and leave bucket with lid on for 24hrs (next day etc) for water to rise back up again and for solids to settle downward, then tip off small sealant layer of water. The Ready Mix Lime Putty is already pre-mixed through so you only maybe need to give a little stir prior to use. After use you can then add a small sealant layer to top of the lime putty that remains, place lid back on and leave. Mix will last for a very long time if doesn't dry out.